To a “pyronaught” like me it’s always a great barbecue idea when you can pluck a very traditional dish and adapt it for the BBQ grill. 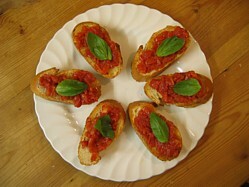 This is my version of bruschetta (pronounced brusketta) that great Italian appetizer that is also served in northern Spain as Tapas (pan con tomate). Note how I've used basil leaves to garnish? It's not essential but it is a nice touch. Wherever you go in Italy or Spain this is an absolute staple and you'll no doubt find it very close to the top of every menu card. I have to admit that there really isn't anything better than using the fresh local tomatoes but since I can't get them over here I'm going for the next best thing - plum tomatoes. If you get really stuck you can get away with canned plum tomatoes, these will already be peeled so if you're going down this route then pick up the method statement after the peeling stage because you still need to remove the seeds. In essence what you are looking for is to retain the flesh of the tomato, everything else can be discarded. 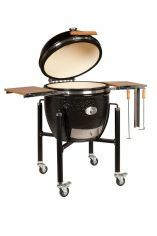 In this vegetarian barbecue idea all I’m using the BBQ grill for is to toast the bread and surely everyone can make toast? All the preparation is done in advance so when it comes to serving, all you need to do is toast a bit of bread and spoon on the tomato mix and because it’s so quick to do there’s plenty of coals left for doing your main course. To peel tomatoes use a knife to make a cross in the sharp end of the fruit (the opposite end to where the stalk was attached) and then place the tomatoes in a large bowl. Pour over a kettle of boiling water to cover the tomato and let them steep for a couple of minutes. Remove a tomato from the bowl using a slotted spoon and you'll see that the skin comes away easily. To remove the seeds, slice the blunt end off (where the stalk was attached) to reveal the two or three vacuoles where you'll find the seeds. Take a thin knife to slice the pith where the seeds are attached to the fruit and then use the tip of the knife to "spoon" out the seeds. You're now left with just the flesh, everything else can be discarded. Chop the flesh into a small dice, place it all in a bowl and add the salt. Cover and refrigerate for an hour and when done you'll find that a load more water has leached out. Sieve the mix and you're left with pure tomato flesh. Mix in the olive oil to create an emulsion and taste - you may need to add a little more salt. You're now ready to assemble. 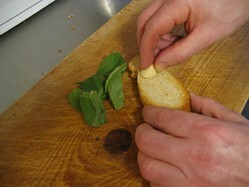 Slice the bread and toast lightly on the BBQ grill, halve the garlic clove and scrape the garlic across the bread. Spoon the tomato mix on top, finish off with a piece of basil leaf and weh-hey! Note:- Always tear basil leaves, never chop it otherwise they turn black in colour. The best is to leave them whole until the last minute and then rip them apart. Can you make these as quick as they get eaten? I had the whole family round and seemed to spend all my time preparing these whilst they spent all their time eating them! Sometimes it's a simple vegetarian barbecue idea like this that works best for an appetizer. I guess bruschetta is just the epitome of all things from the Mediterranean, keep it simple, keep it fresh and you can’t go wrong.